The audio output of the Samsung S3650 Corby is pretty pleasing, save for one minor flaw. The stereo crosstalk reading in our traditional test came up pretty poor, suggesting some leakage between the two channels. However since this is purely a mechanical problem we are suspecting that it is mainly due to the pre-release status of our unit and it might as well be taken care of in the final version. The noise level and dynamic range readings on the other hand are excellent even at this stage. 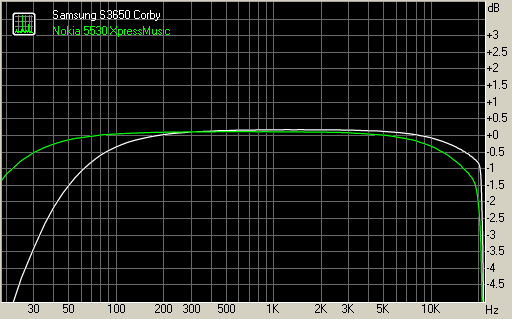 The distortion levels are also kept well under control and the frequency response is pretty good. In case you are wondering about the big deviation numbers that goes in that column in the table - it's mainly due to the extreme low-frequency sounds which have been cut off, but the line goes pretty near to perfect in the rest of the range. Here goes the table and the graph so you can see for yourselves. The Samsung S3650 Corby features a 2 megapixel fixed focus camera for maximum image resolution of 1600 x 1200 pixels. The camera is not some spectacular performer, but it's quite alright for a 2 megapixel snapper. The iPhone 3G can hardly do any better, you know. Noise suppression is a bit too aggressive at times, eradicating all fine detail, but it seems passable. The worst part though is the lens problem resulting in annoying softness on the right half of every photo. We suppose this is a unit-specific issue and in reality things should be as good as the left half of the sample images. Plus, we have a pre-release sample on our hands here and Samsung engineers will surely improve things. The video recording capabilities of the Samsung S3650 Corby are very poor - it maxes out at QVGA@15fps. Hardly any usable videos can be produced with those specs but the consolation is that the competing LG Cookie doesn't offer anything better either. Here is a sample Samsung S3650 video recording for you to check out. The Samsung S3650 is usable worldwide with quad-band GSM support - even though Europe is its main market at this point. The handset omits 3G support so users are stuck with EDGE as there's no Wi-Fi on board either. At least Bluetooth is enabled and comes with A2DP support. Unlike the majority of recent Samsung devices which sport a microUSB port, the S3650 Corby is (mis)treated to the company's older proprietary port. Hooking it up with a USB cable, allows you to set up the phone in mass storage mode or PC suite mode (or Media player) or to prompt each time it's paired with a computer. In mass storage mode, it gives access to the memory card but not to the internal memory and you cannot use the phone for calls or data while connected. Annoyingly, it would often be impossible to access the memory card on the S3650 for a couple of minutes after connecting in mass storage mode - but that again might be one of our pre-release mishaps. The Samsung S3650 Corby, like the Samsung S8000 Jet, features the new WebKit-based Dolfin web browser, which is a home-brew application. With full Flash support and the new one-finger zooming algorithm, it is one of the finest web browsers we have seen on a feature phone. As suggested, the full Flash support extends to include full featured YouTube videos as well. Given that EDGE is your only connectivity option, we guess however that using the light handheld version at m.youtube.com will be way more practical.